So I got a note from Kristin on Facebook: "I have something for you and Joe that will make you laugh out loud and giggle to yourselves! Hee-hee!" And when I got home today (Lousy Day One of Five Craptastic Days filling in on a set of duties that I loathe), I noticed a box by the kitchen door. It was a package from a favorite supplier of the heroin-for-me that is pottery (they are also friends of the Newbys). Inside that carefully-insulated box was a lovely, hefty coffee mug. On the front it says, "How 'Bout A Cup"
Kristin, this is so very perfect. I've decided I get to keep it at work because Joe already has this hanging above his desk. You are the best, sweetie - and you have made me smile tonight, without a doubt! Mwwaah! Much love to you! That is full to the brim of HOT STEAMING WIN!!!!!1! ...I always think I want to spell "awesome" that way and then after I've typed it I nearly always think it was a bad idea and re-type it. 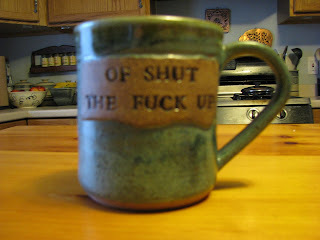 Anyway, that is a super awesome mug.